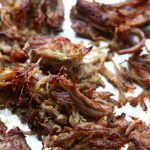 Instant Pot Crispy Pork Carnitas–pork is cooked until tender in your Instant Pot with onion, garlic, jalapeno, and lots of spices. 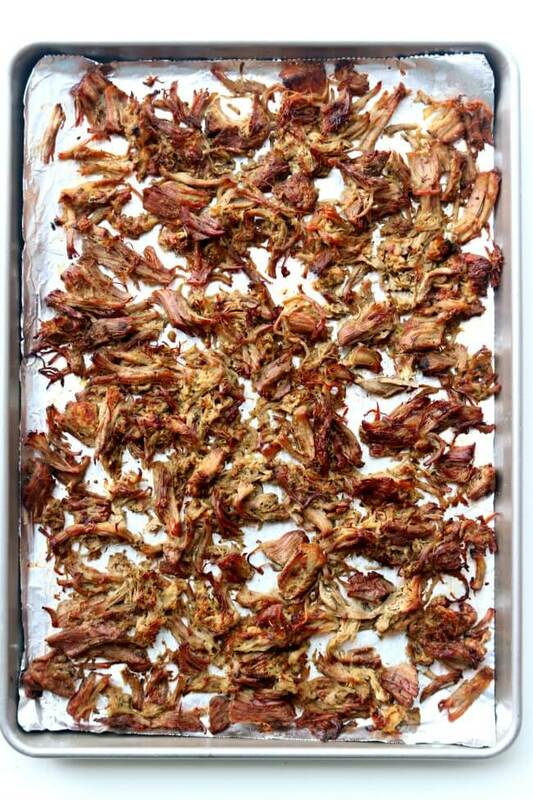 Then the pork is crisped up under the oven broiler to create maximum flavor and texture for tacos, salads, burritos, nachos and enchiladas. One of my favorite things to make in the Instant Pot is pork. I buy this big bag of pork at Winco that is called “pork carnitas meat” and cook it with a little broth and it comes out perfectly tender and shreddable. 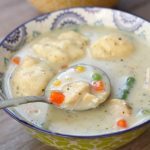 The Instant Pot can make this usually long process happen within an hour and a half. Amazing. Today I decided to make instant pot crispy pork carnitas. According to Wikipedia traditional carnitas are “made by a process of simmering the meat in the lard until tender over a very low heat. Once appropriate tenderness is achieved, the heat is turned up and the outside of the pork begins to crisp. At this stage, the collagen in the meat has broken down sufficiently to allow it to be pulled apart by hand or fork or chopped with a cleaver. The meat can then be used as an ingredient in tamales, tacos, tortas, and burritos.” Now I didn’t use lard in my recipe but I did use a process that allowed the collagen to break down and I did crisp up the meat. 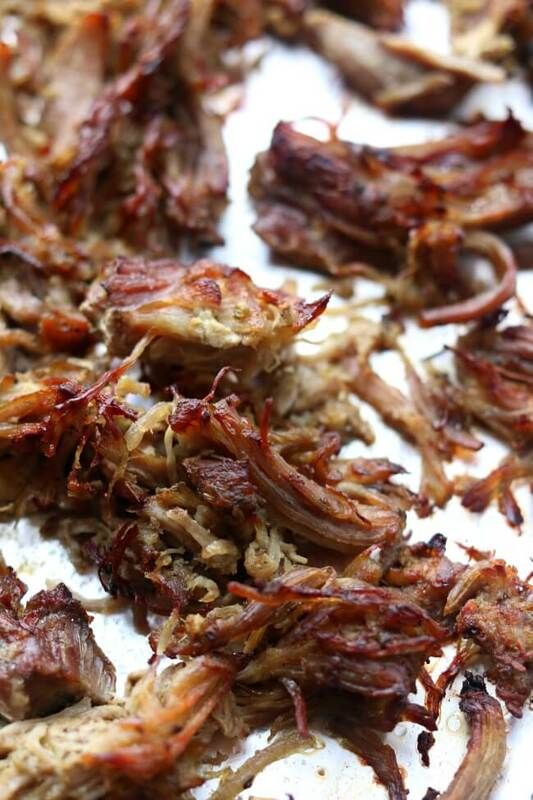 I love how these instant pot crispy pork carnitas are so tender and juicy on the inside and golden and crispy on the outside. The broiling step seriously brings this pork to the next level. I served this pork with tortillas, cheese, fresh garden tomatoes, lettuce and sour cream. My only regret is that I didn’t have any guacamole to serve with them too. Next time. Next time. Pork Florentine from What’s Cookin’ Chicago? 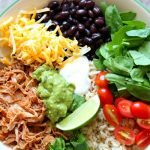 To cook these instant pot crispy pork carnitas I used my 6 quart Instant Pot Duo 60 7 in 1 for this recipe. I also own the 6 quart Instant Pot IP-LUX60 V3 Programmable Electric Pressure Cooker. They are both great pressure cookers! The first one I mentioned has a yogurt making function but other than that they are fairly similar. The price difference between the two is about $20. Pork is cooked until tender in your Instant Pot with onion, garlic, jalapeno, and lots of spices. Then the pork is crisped up under the oven broiler to create maximum flavor and texture for tacos, salads, burritos, nachos and enchiladas. Place quartered onion in the bottom of the Instant Pot. Pour in the chicken broth. Add in the bay leaves. Add in the pork, garlic and jalapeno. Sprinkle the pork with the salt, pepper, oregano and cumin. Cover the Instant Pot and secure the lid. Make sure valve is set to “sealing.” Press the manual button (high pressure) and set the timer to 70 minutes. When the timer beeps, let the pressure release naturally. It will take several minutes. 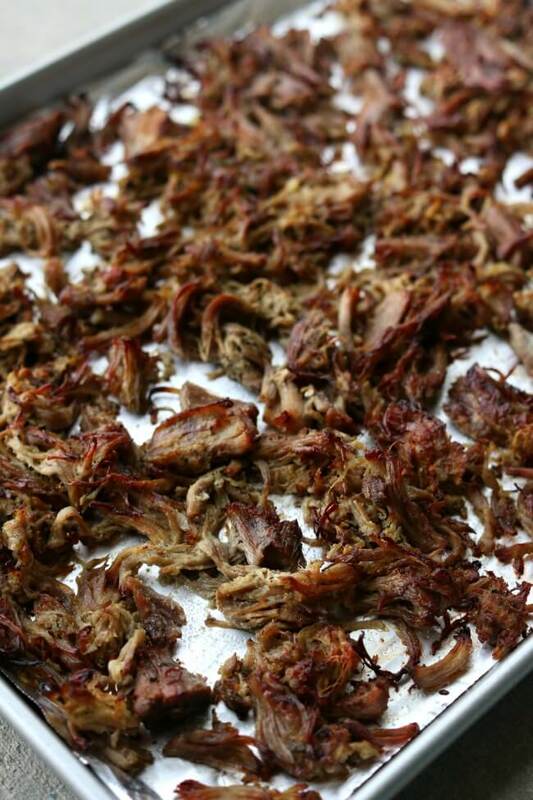 Remove the lid and shred the meat on a cutting board. Reserve the juices in the Instant Pot. Turn your oven to broil. Place the meat in a foil-lined pan (I used a cookie sheet with and edge). Spread the meat out so it isn’t piled on top of each other. Place the pan in the oven for 5 minutes. Pour about 1/4 cup of the juices from the Instant Pot over the meat and place in the oven for another 5 minutes, or until meat comes to your desired crispiness. I ended up putting them in the oven for a total of 15 minutes. Salt and pepper the meat. Toss the meat with the lime juice and any extra juices you’d like from the Instant Pot. Serve the meat in any mexican meal you’d like, salads, burritos, tacos, enchiladas, quesadillas etc. 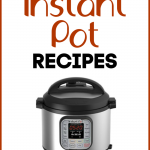 I used this Instant Pot. 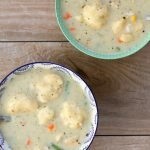 Click here for the slow cooker version. 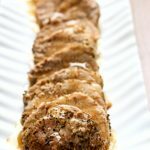 Is it possible to cook frozen pork shoulder with this recipe? yeah I bet it would be fine. You’ll need to add some time. I’d add 20-30 minutes. Tonight. Chicken fell off the bone, I loved it w our coconut pineapple rice. Only issue was the sauce was runny and not thick and sticky like I expected it to be. I followed the recipe exactly. 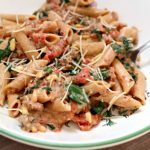 What can I do next time to make sauce thicker? I cooked on normal, should I have cooked on high or cooked longer? Also it didn’t depressurize naturally after 10 minutes so I tirned the valve because it was late. But I think w minor tweaks I will most definitely make this again!